Hydrangea: Full sun to part shade Hardiness varies Flowering shrub. It seems not that long ago that hydrangea were only found in grandma's garden. With so many new varieties, they are widely used in foundation plantings, landscaping and gardens. They are wonderful singly or in masses, most doing best in shade to part-shade. But not dense shade, if the grass won’t grow, neither will your hydrangea. If your hydrangea should fail to flower, it could be due to winter kill of the buds, pruning at the wrong time, too much shade for the variety or excess nitrogen. 'Annabelle' (Hydrangea arborescens) produces enormous white "snowballs" in summer, keeping a mounded shape at about 4 feet. It does best in part to full shade, but will tolerate full sun if it receives enough water. Unlike the macrophylla hydrangeas, arborescens will bloom every year even after winter dieback (which will happen in the north zones) or severe pruning, because ‘Annabelle’ blooms on new wood. Normally, prune only sparingly to encourage stems to grow sturdy enough to support the heavy blooms and to encourage more, but just slightly smaller blooms. Grows to 4-5’ high and 3-5’ wide. Hardy to zone 3, perhaps even 2, but will often die back to the ground. This does not affect flowering since it flowers on new growth. An occassional ‘Annabelle’ is not a good bloomer, so buy yours in bloom to make sure you get one that is not skimpy. Macrophyllas are the “mophead” hydrangeas. Hydrangea macrophylla include the “colored flower” cultivars; Endless Summer and Nikko Blue. They are really only hardy to zone 6 and typically may not flower in zone 5. Varieties that flower on old wood - since they often die back to the ground in zones 4 and 5, they will not flower. Zone 5 hardy Hydrangea should be heavily mulched to ensure the roots are protected. In regions that drop below -38 degrees, further protection is advised, treating the plant almost like a hybrid tea rose. Mound several inches of soil at the base of the plant, and mulch heavily may improve the chances of a successful bloom in spring. The hydrangea with blue and pink flower heads require close attention to soil pH to retain their color. If you do not have acid soil (pH of 6 or less), it is easiest to control in a container with aluminum sulphate, which is commonly found in gardens centers for the colored hydrangeas. Mopheads struggle in sandy soils and dry conditions. Mopheads never need pruning other than to remove dead branches. They bloom in June or July on old wood, forming their flower buds just afterward in August or September. (‘Endless Summer’ is an exception, it will bloom on old AND new wood). Pruning of 1/3 or more of the branch length to reduce size should be done immediately after blooms fade to preserve next years’ bloom, but the shrub grows back so quickly that the pruning is nearly useless. Simply removing the dead flowerheads (deadheading) can be done at any time. Up to one third of the old stems may be removed to the ground to rejuvenate an old plant. ‘Blushing Bride’ (Hydrangea macrophylia) produces 4-8’ flowers with dark green foliage. It is common to see a broad range of bloom colors on a single plant, from pink blush, to deep pink. Blooms open pure white and mature to blush pink or deep blue depending on soil pH. It blooms on old and new wood. Strong stems and branches keep the blooms upright, and perfect for cutting. Grows to 3-6’ tall and wide. Does not like full sun. Hardy in zones 5-9. ‘Endless Summer’ (Hydrangea macrophylia ‘Bailmer’) This showy mophead blooms on old and new wood, producing blooms even after winter dieback. However the plant has not been found to be highly reliable in zone 4. Complete dieback after a zone 4 winter can take the better part of zone 4’s short growing season to regrow. Blooms come so late that the first frost may be right around the corner. Try in a container to bring indoors for the winter, or in a very protected microclimate. In the south, ‘Endless Summer’ will produce two full bloom periods. Flowers tend to pink but will turn blue in acid conditions (pH of 6 or less). Grows to 3’ high and wide. Hardy in zones 4-9. ‘Nikko Blue’ will produce pink blooms in alkaline soil, blue blooms in acid soil (pH of 6 or less) in July and August. Aluminum sulphate added to the soil in late autumn or early spring will make the blooms bluer, lime will make them pink. ‘Nikko Blue’ blooms on old wood. It prefers medium moisture, well drained soil in part shade. If grown in full sun it requires constant moisture. Reaches 4-6’ tall and wide. Hardy in zones 6-9. Macrophylla normalis are the “Lacecap” hydrangeas, and are grown and cared for exactly the same as the mopheads. They are not quite as showy, but can be quite graceful and magnificent in a more subtle way. Lacecaps never need pruning other than to remove dead branches. They bloom in June or July on old wood, forming their flower buds just afterward in August or September. Pruning of 1/3 or more of the branch lengths to reduce size should be done immediately after blooms fade to preserve next years’ bloom, but the shrub grows back so quickly that the pruning is nearly useless. Simply removing the dead flowerheads (deadheading) can be done at any time Up to one third of the old stems may be removed to the ground to rejuvenate an old plant. Hydrangea ‘Light O Day’ is interesting when out of bloom, with bold variegated leaves. It is a more reliable bloomer among the variegated varieties. Inner blooms can be pink or blue, surrounded by white. It is a lacecap mutation of Endless Summer, but will not rebloom. For best bloom production, plant in lightn shade, dappled shade, or morning sun with afternoon shade. Hardy in zones 5-9. ‘Tokyo Delight’ will produce pink blooms in alkaline soil, blue blooms in acid soil (pH of 6 or less) in July and August. Faded blooms begin to turn shades of burgundy in autumn. Blooms on old wood. Prefers part shade in moist, well drained soil. Grows to 3-6’ high and wide. Hardy in zones 6-9, perhaps in zone 5. ‘Mariesii Variegated’ has cream edged foliage and is long blooming in early to midsummer. The cream variegation is not stable, and will sometimes revert to all green. Bluish white florets surround bright blue florets. Grows best in part shade in zones 8 and 9, full sun more north. Reaches 5’ high and wide, growing in a dome shape. Pruning should be done right after the blooms fade, as it sets new blooms immediately after flowering. Blooms best in zones 8 and 9, bloom buds may freeze off in colder zones. Hardy in zones 5-9. Hydrangea quercifolia, “Oakleaf”, are white blooming and are winter hardy further north than the arborescens. The leaves are shaped like oak leaves. It blooms best where summers are hot, but is hardy further north than the mopheads. They can survive in dry conditions and with little attention. They do not like wet feet and must have excellent drainage to avoid root rot. Oakleaf never need pruning other than to remove dead branches. They bloom in June or July on old wood, forming their flower buds just afterward in August or September. Pruning of 1/3 or more of the branch lengths to reduce size should be done immediately after blooms fade to preserve next years’ bloom, but the shrub grows back so quickly that the pruning is nearly useless. Simply removing the dead flowerheads (deadheading) can be done at any time Up to one third of the old stems may be removed to the ground to rejuvenate an old plant. ‘Snow Queen’ is considered one of the finer shrubs for the landscape and garden. Large dark green leathery leaves and 12 to 15” pure white upright panicles of blooms make a striking presentation. Foliage turns burgundy in fall. It is highly pest and disease resistant, and grows well in either full sun or part shade Planted 5 feet apart, ‘Snow Queen’ forms a wall of white blooms. Reaches 10-12’ high and wide. Hardy in zones 5-8. The elegant 'Pee Wee' produces 10” elongated flower heads of white that turn pale pink by fall. ‘Pee Wee’ is a dwarf ‘Snow Queen’ which will do well in full sun to part shade. Leaves turn burgundy-brown in fall, beautiful with the dried flower heads. Grows to 4 feet high and 3 feet wide. Hardy in zones 5-9 ‘Sikes Dwarf’ is similar, but will do quite well in mostly shade. Paniculata are the “PeeGee” hydrangeas. Panicle Hydrangeas (Hydrangea paniculata) is a much larger shrub, 10-15 feet high and wide, and produces pyramid shaped flowerheads that turn from white, to pinkish, finally to brown in fall. Panicle hydrangea bloom on the current year’s growth, so they can be pruned in fall, winter or spring. However they do not need pruning every year. Prune out only crossing branches and as needed to achieve desired form. PeeGee hydrangeas need more sun than the mopheads, several hours a day. They are also hardy to zone 3. ‘Grandiflora’ is the famous ‘PeeGee’. It is an upright mounded shrub, but is also grown as a small ornamental tree. The pure white conical flowers appear in July and August, and they mature to pinky bronze in fall. The dried flowerheads are beautiful in arrangements. Grows to 8’ high and 10-15’ wide. Full sun to part shade. Hardy in zones 3-8. ‘Limelight’ is a newer variety of hydrangea. It has unique bright lime green flowers that form a rounded panicle. ‘Limelight’ blooms profusely on new wood in midsummer. 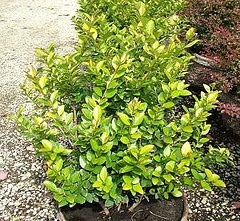 Grows well in full sun to light shade, the lime color will be more pronounced in some shade. Particularily in more southern zones, will benefit from some light shade. Reaches 6-8’ tall and wide. Hardy in zones 3-8. ‘Pink Diamond’ develops huge 10 inch pink flower buds that open to white in late summer, then the pink intensifies as the blooms age. Hot weather and sun may diminish the bloom color. This hydrangea makes a stunning statement as a specimen plant. Does best in sun to part shade, and grows to 6-8’ high and wide. Hardy in zones 3-8. ‘Tardiva’ is similar to ‘PeeGee’ but blooms later, in mid August, with larger flower panicles held on thick stems. With a loose, shrubby growing habit, ‘Tardiva’ reaches 6-8’ high and 8-10’ wide. Grows well in full sun to part shade. Hardy in zones 3-8. Japanese Rose: (Kerria japonica) Full sun to shade Hardy in zones 5-9 Flowering shrub This graceful flowering shrub with arching branches produces large golden yellow buttercup flowers in spring. 'Pleniflora' produces double blooms. Although it would make a beautiful specimen plant, it should be planted against a wall or in a border so it is protected from wind. Grows to 6-8 feet and 6-9 feet wide, with an upright form. ‘Golden Guinea’ has larger flowers and blooms for a longer period. Japonica prefers moist well drained soil, and flowers will stay “fresh” longer in part shade. Lilac: Full sun Hardy in zones 3-7 Flowering Shrub. Whether you chose an old fashioned or a hybrid, you can’t beat the beautiful spring scent of a lilac. You will find traditional purple-blue, whites, pink or red pink, and even yellow blooming lilacs. Tried and true hardy to zone 3, most reaching between 8 and 12 feet but can be pruned. For a smaller rounded lilac with sweetly perfumed blooms, try the 'Miss Kim'. Mock Orange: (Philadelphus coronarius) Full sun to part shade Hardy in zones 4-8 Flowering shrub. Large rounded flowering shrub up to 12 feet high and wide, but can be kept pruned to a smaller size. Early summer flowers have the sweet scent of orange blossoms. Prefers full sun and moist, organic, well drained soils. Will tolerate light shade and moist soils. Prune after flowering, can be pruned heavily to rejuvenate an old plant. Transplants well. Hardy to zone 4, if protected perhaps in zone 3. Snow Dwarf is a fragrant dwarf reaching just 2 to 3 feet tall. Bred in Canada, it is truly hardy in zone 4 without protection. Blooms prolifically in spring, and will thrive in sun or part shade. Philadelphus lewisii ‘Blizzard’ is even hardier, hardy in zones 3-7, and larger, reaching 4-5’high and 3’ wide. 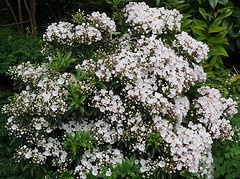 Clusters of fragrant single whit blooms cover the shrub from early to mid summer, lasting as long as 4 weeks. 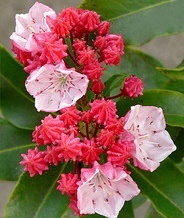 Mountain Laurel: (Kalmia latifolia) Part sun Hardy in zones 5-9 Flowering shrub. Preferring a dappled sun, Mountain Laurel performs well along a woodland edge, particularly where the soil is rich and pH is acidic. This is a fabulous spring blooming shrub if you have the right place for it. It will not perform well in full sun or full shade, and does like cool moist soil that is acidic and organically enriched. Also avoid exposing it to harsh wind. The shrub will be compact and rounded in fuller sun, more open and loose in shade. 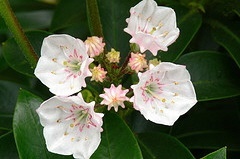 Mountain Laurel produces showy flowers in late spring. The blooms are produced in 4-6” clusters of 1” cup shaped blooms and are borne above glossy deep green foliage. In full sun foliage may tend to be more yellow. Even in cold and snow, the foliage remains evergreen through winter, although some varieties do not fare well in the more northern zones. 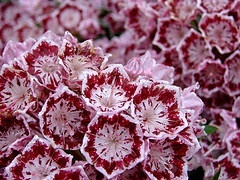 Kalmia is often referred to as Sheep Laurel or Sheep Poison, as the foliage is toxic if eaten, to both animals and humans. Do not plant where animals may graze or “taste” the foliage or if small children may be in the gardens. There are many varieties available. ‘Elf’ is one of the more commonly grown varieties for a number of reasons. It is quite tolerant of the cold and often thrives in zone 4b, perhaps even 4a if in a protected place in the landscape and heavily mulched in winter. It was also the first dwarf available, making it ideal for the front of the border of foundation plantings. It grows slow and compact reaching only 2 to 3 feet high and wide. However, very young plants grow vigorously, and should be pruned to keep them from getting leggy. Pink buds open to white blooms in May and June. ‘Elf’ is hardy in zones 5-8, 4 if protected. ‘Bullseye’ is one of the very colorful varieties with blooms of white and red-purple. Blooms are not produced when young. Its’ growth habit is upright and vigorous, reaching 6 to 9 feet tall and wide. The blooms may last three or more weeks in May and June. Will not tolerate the cold of zone 4, but withstand the heat of zone 9. ‘Olympic Wedding’ has bloom coloring very similar to ‘Bullseye’. ‘Olympic Wedding’ grows to about 6’ high with a 5’ spread and is hardy in zones 5 - 7 in the South, zone 8 in the West. ‘Olympic Fire’ is a very popular variety, with blooms that begin with a bright red bud, quite stunning along a woodland border. Once opened, pink blooms fade to pink tinged white. Bloom is a tad later, opening in early June. The shrub grows at a moderate rate of about 4-6 inches per year, reaching up to 4 or 5 feet tall and wide, but could get larger in ideal conditions. Form is dense and rounded. Kalmia grown in moist shade can be susceptible to leaf spot, but ‘Olympic Fire’ is quite resistant. Hardy in zones 5 - 8. With winter protection, it may survive in zone 4. Nanking Cherry: (Prunus tomentosa) Full Sun Flowering shrub Hardy in zones 2-6. This is a densely twiggy shrub that becomes more open and quite picturesque with age. Fragrant white flowers bloom early in spring and produce edible fruit that ripens in June or July. Bark is reddish and exfoliating. Medium to dark green foliage becomes yellow in fall. Must have full sun and will tolerate wind and drought. Great for windbreaks. Grows moderately quickly and is relatively short lived. May begin to deteriorate after 10 years. Reaches 8-10 feet high and 10-15 feet wide. Ninebark: (Physocarpus) Full sun to part shade Flowering shrub Hardy in zones 2-7. 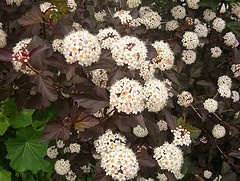 Ninebark is a super hardy shrub, most are cold hardy to zones 2 or 3. They will grow well in soils that are dry, moist or wet, tolerate compacted soil, and alkaline soil. Will tolerate windy sites as well. They are a very serviceable shrub, though not all are particularily beautiful. Most will need regular pruning to maintain a good shape, and are quite tolerant of severe pruning and shearing. But for difficult sites, for screening, or backdrop, they will do an excellent job and remain healthy in some poor conditions. For such needs, choose the ‘Nana’, which is 4-6’ high and wide, ‘Dart’s Gold’, or‘Luteus’. 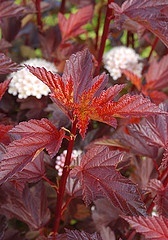 ‘Coppertina’ is one of the more lovely Ninebark, with an upright vase shape form. Foliage is copper colored when young and matures to a rich red. Small white button flowerettes appear in mid summer, followed by red fruits in late summer to fall. Flower buds are set in late summer, so pruning should be done right after blooms have faded. Best color develops when grown in full sun. It reaches 6-8’ high and 3-4’ wide. Excellent in groups or masses, as a foundation planting, or in the shrub or perennial border. It grows quickly, and provides all season color and interest. Hardy to zone 3. ‘Dart’s Gold’ is a basic, but tough Ninebark, and the yellow gold foliage is a nice contrast to deep greens in the landscape or gardens. It is fairly compact is it’s growth habit, reaching 4-5’ high and wide. White flowers appear in early summer, and red fruits develop in mid to late summer. ‘Dart’s Gold’ is a very vigorous grower, but prunes or shears well. Hardy in zones 2-7. ‘Summer Wine’ is very similar to ‘Diablo’, but is a more compact plant at 4-6’ high and wide. Foliage is a finely cut reddish purple, and should be grown in full sun for best color. Pinkish white flower clusters appear in May and June. Flower buds are set in late summer, so pruning should be done right after blooms have faded. (‘Summer Wine’ is also trademarked, you may find it marketed as ‘Seward’.) Hardy in zones 3-7. Potentilla: (Cinquefoil) Full sun Hardy in zones 2-6 Flowering shrub. Referring to the woody bush, this 2-3' mounded plant produces tiny bright flowers. This one has blurry lines between herbaceous perennial and woody shrub. 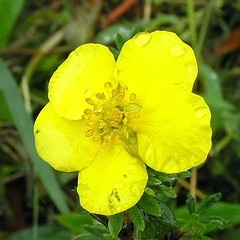 You will find both types as potentilla and/or cinquefoil, cinquefoil simply being the old French common name. If you select one hardy to your zone, with the physical characteristics you choose, it doesn’t really matter. The shrubby potentilla prefers moist well drained soils, but is very tolerant of either wet or dry, and very tolerant of alkaline and compacted soils. It is also drought tolerant and blooms from spring til frost. If you think potentilla has been overused, it is because it is so very hardy and easy to grow. There are many nice varieties and bloom colors available, although the yellow are the old standby so commonly seen. Trim it in very late autumn or early winter while dormant if you like, or just let it grow to its’ full size. It will usually retain a pretty nice shape without trimming. It is very tolerant of severe renewal pruning, but removing old branches to the ground with a light shearing periodically will keep the shrub fresh. Hardy in zones 2-6 depending on variety. May need part shade in the warmer climates to retain good bloom color. Potentilla fruticosa ‘Abbotswood’ is a dense, spreading shrub, making it nice for a low hedge. Growing habit is mounded with upright branches. Perhaps the best white flowering potentilla, the blooms are large and set off nicely against the blue green foliage. Blooms from spring to fall. Grows to 3 feet high and wide. Best in full sun. Hardy in zones 2-6. 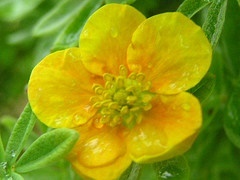 Potentilla fruticosa ‘Gold Star’ produces an abundance of 2”golden yellow blooms all summer. Deep green delicate leaves and a compact, mounded growing habit make a lovely specimen plant. It is a low grower, so it also works well as a ground cover or to “hold a hill”. It will also do well in a container, but make sure to give it a good sized pot. Thrives in full sun. Grows quickly to 2 feet high and 2-3 feet wide. Hardy in zones 3-9. Potentilla fruticosa ‘Mango Tango’ is a lovely newer introduction, developed at the University of Manitoba. Bi-color flowers have a yellow base, with orange and red markings radiating from the center. 2” blooms are produced throughout the summer, shearing after the first spring flush of bloom will encourage reblooming. In cool weather the blooms are more red and orange, developing more yellow as the summer heats up. Very adaptable to poor soil and wet or dry conditions. Neat and compact growing habit makes it a good choice for border planting. Reaches 2 feet high and wide and grows well in full sun to part shade. Hardy in zones 2-7. Potentilla fruticosa ‘Pink Beauty’ is a small rounded shrub that grows vigorously. Blooms are an intense pink in cooler weather, softening to a blush pink in summer heat. Bright green foliage is fine and lush. Compact mounded growth habit, reaches 2-3 feet high and wide. Does well in full sun to part shade. Hardy in zones 2-7. 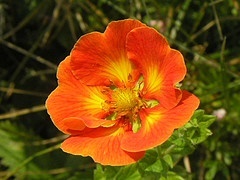 Potentilla fruticosa ‘Sunset’ has rich bright orange-red and yellow blooms from early summer to frost. In part shade color will be more red, in full sun more yellow. ‘Sunset’ is very hardy and long lived. Generally grows to about 2 feet high and 3 feet wide, but can get larger. Unpruned, the shrub may get a little leggy and sprawling. Hardy in zones 2-7. Potentilla atrosanguinea ‘William Rollinson’ is a wonderful low growing plant that produces masses of red orange double blooms with yellow highlights all summer. Grows in neat mounds of silvery backed foliage. Excellent as a ground cover, in a rock garden, or accenting landscaping or perennial beds. Performs best in full sun. Does not like hot or cold extremes. Grows to 16-24” high and 15-20” wide. Hardy in zones 4-8. Privet: (Ligustrum) Privet shrubs are so commonly used as a hedging plant that they are referred to as privet hedge. As a specimen plant, the privet is not particularly appealing, but they take to frequent shearing so well that they are used nearly exclusively for hedges. Privet prefer part shade to full sun, and slightly wet soil, tolerating a wide pH range. Some are semi-evergreen or evergreen, depending on variety and your growing zone. None are evergreen in the north. They are also poisonous, can have ill effects on asthma and excema sufferers, and can be invasive. If the drawbacks are not a problem for you, there is not better hedging plant that can tolerate constant shearing and severe pruning. There are several species of privet with different qualities. Common Privet (Ligustrum vulgare) are hardy in zones 5-8. White flower clusters at the ends of branches are abundant midsummer, but have an unpleasant scent. Fruits ripen to purple-black. Prefers full sun to part shade, and moist well drained soil. Tolerant of alkaline soil and windy conditions. Can reach 12-15’ high and 10-12’ wide if left unpruned. ‘Cheyenne’ is the most cold hardy, to zone 4, ‘Lodense’ is a compact variety growing to only 5 feet. Golden Vicary (Ligustrum x vicaryi) Hardy in zones 5-8. 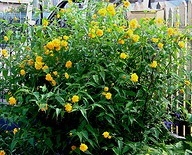 Has golden yellow foliage when grown in full sun, will be green in part shade. 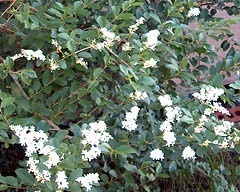 Creamy white flowers with an unpleasant scent appear in late spring. Prefers a moist well drained soil. Will tolerate windy conditions. Grows to 6-12’ tall and 8-10’ wide if left unpruned. Amur Privet (Ligustrum amurense) are hardy in zones 3-6. It blooms in late spring with white flowers, then develop black fruit in late summer. Prefers a little drier soil conditions than most privet, does not like wet soil. Tolerant of alkaline soil and windy conditions. Can grow to 12-15’ high and 8-10’ wide if left unpruned. Japanese or wax privet (Ligustrum japonicum) are hardy in zones 7-10. Blooms in summer with white flowers, then develop black fruit in late summer. Leaves are thick, evergreen and glossy. Displays good fall color. Growth habit is vigorous and dense, reaching 15-18’ if left unpruned. Will tolerate a little drier soil conditions than most privet, and more shade. Chinese Privet (Ligustrum sinense)are hardy in zones 7-10. 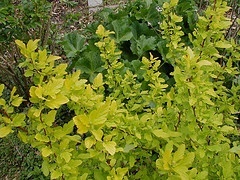 Foliage is dark semi-evergreen but is also available with yellow white variegated leaves. Small white flower clusters are unnoticed against the variegated leaves. Grows rapidly to 12’ high and 10’ high if left unpruned. 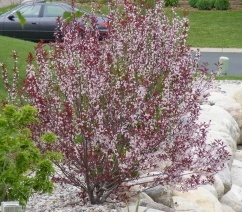 Purple Leaf Plum: (Prunus cistena) Full sun Hardy in zones 4-9. 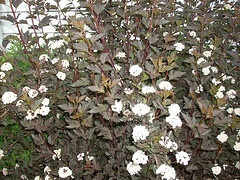 This Sandcherry shrub is commonly grown in the north because of it's reliability and hardiness. The 6-8' bush sprouts bright red leaves in spring with tiny pink flowers. Well drained acid soil will bring out the best leaf color, but will tolerate alkaline soil as well as heat and drought. Leaves turn red-purple, then maroon by fall. A nice color contrast to greens in the landscape. Prunus cerasifera is a larger version, that can grow to 25’ high and wide in a rounded shape. It grows fairly quickly, which tends to shorten a shrubs life. Both shrubs seem reliably hardy in zone 3. Purpleleaf Sand Cherry (Prunus x cistena) Full sun Flowering Shrub Hardy in zones 3-7. This tall shrub is generally grown for it’s unique foliage color. Leaves open bright red in spring, stay intense reddish purple all summer and turn more red in autumn. 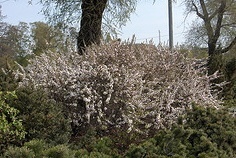 The shrub is covered in fragrant, small, blushed white blooms in May. Beautiful as a specimen shrub or as a tall hedge, it does take pruning well. Prefers a moist well drained soil. Purpleleaf Sand Cherry does not live a long life, and may begin to delcline after 10 years. Reaches 7-8 feet tall and wide. Flowering Quince: (Chaenomeles japonica) Full Sun to part shade Hardy in zones 4-8 Flowering shrub. This "fairy fire" blooms bright red, peach pink, or orange in spring. 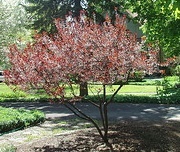 Foliage opens red bronze and turns dark green in summer. Excellent at the back of a border, hedge or foundations planting. Grows 3-5 feet, zone 4. C. x superba 'Cameo' produces large semi double flowers in coral pink. ‘Jet Trail’ has white flowers and grows to about 3 feet. ‘Texas Scarlet’ is covered with red flowers and is smaller, at 2-3 1/2 feet. Quince prefers moist well drained soil, by will tolerate some dryness, also prefers a slightly acidic soil. Grows to 5 feet, most cultivars hardy to zone 5.